It's amazing how much can be suggested in just a few, well-chosen words. Sometimes, if you're lucky, you'll encounter a string of words so evocative, an entire portrait is painted in your mind, giving you an eavesdroppers' view into someone's life. Craigslist is a great place to find these wonderful phrases, economical with their words but generous with their imagery. Great runner. Girlfriend pregnant , wife mad must sell all my toys . U must take items on car. There is bbq parts, arrows, mt. Dew cans. There may also be a few items that u may throw away. Let's break this down a bit. First off, we learn that this rather pedestrian ride runs — hell, it's a great runner. Okay, that's all the details you need about the car, right? Good, because aside from repeating the claim that the car runs and admitting that it ran with low oil, that's all you get. I'm sorry, I mean that's all that U get. SO, car condition out of the way, the seller jumps right into the good stuff: he has a pregnant girlfriend. Hey, mazel tov! Oh, and a mad wife. Hm. Okay, so our condomless Craigslister's punishment for adultery and out-of-wedlock siring? He has to sell his "toys." And what toys! 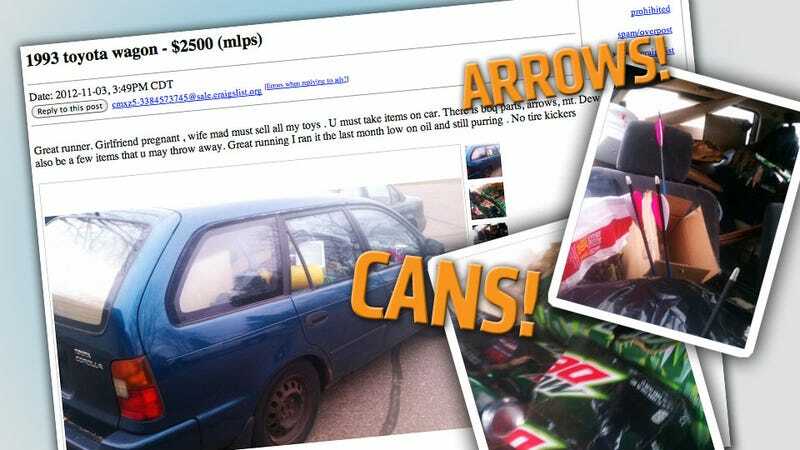 A small Japanese wagon, unburdened by wheel covers, filled to the brim with arrows, parts from barbeques, and, best of all, Mountain Dew cans. It's not really clear if the cans are enclosing cylindrical volumes of lurid yellow Dew or just Dew-scented air. The pictures seem to suggest the latter. The pictures also reveal such unspoken treasures as what appears to be a lidless styrofoam cooler, A McDonald's bag, an apparently empty cardboard box, a number of black garbage bags filled with unnamed treasure (my guess is Kruggerands and bolts of silk, but I suppose it could also be discarded tampons and more Mountain Dew cans), and a yellow plastic cylinder of unknown function. If you're so blighted that you're unable to see the value of these "toys," please note the seller states "There may also be a few items that u may throw away" so you grudgingly have permission to discard a perfectly awesome McDonald's bag archery quiver. If you're, you know, nuts. This whole package — and keep in mind, this is not just an early '90s Toyota with steelies browned to a rusty perfection but a mobile joy enclosure — is a mere $2500. Remember, these bags of recycling are this man's toys, so valuable to him that their removal was the only way the woman he's married to can rectify the violation of their marriage vows. That's what you're buying, remember. A man's happiness, sold to pay for a night of illicit passion that culminated in the creation of a human life. So no lowballing. Oh, and no tire kickers, either. This man's time is valuable.